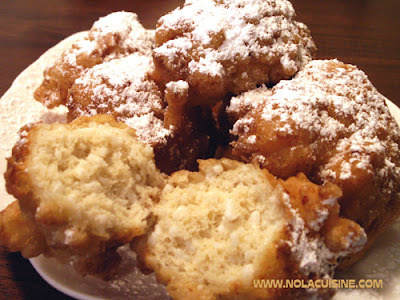 This really is a wonderful recipe Beignet recipe. The only thing in my opinion that could improve the flavor of these Beignets would be of course to eat them in the French Quarter with the sounds, sites and smells (yes even some of the bad ones) of a morning in New Orleans, with a whole day of adventure ahead. Actually, that’s what this whole site is about, that first bite of a dish that magically takes you to another place and time, or makes you yearn to discover the people and place that created it. I made this batch of Beignets for my niece who was staying over for the weekend, and my daughter, neither had ever had them before. I’m glad I was the one who got to introduce them to Beignets. After her first bite my niece Noelle exclaimed, “Wow! This is the best thing that ever set sail in my mouth.” Ah, to be nine again. I changed the pic on the page with the recipe, as this one turned out much better than the former, but the Beignets were from the same recipe. I made a few discoveries while making this batch, however. One, the second rise isn’t really necessary, the heat of the oil puffed them right up, this may be partially due to the fact that I used two envelopes of yeast instead of one, but I think they will rise with one. I’m going to make an adjustment to the recipe. Just for fun here are some pics from our last trip to Cafe Du Monde last February. As always, I’m dying to get back to New Orleans. At the turn of the last century, the “Calas Woman” was still a fixture in the French Quarter marketplace in the early morning, crying Belle Cala! Tout Chaud! and carrying a covered basket or bowl on her head filled with the Rice fritters to sell to the Creole cooks who would serve them with coffee or Cafe au Lait. The name is said to be derived from an African word for rice. The Calas women are long gone, and for the most part, so are Calas (KAH-luhs). These lovely rice fritters have taken a back seat to Beignets over the years, but they’re second to none in flavor and texture in my kitchen. The slight tang of the souring step in this recipe, the nutmeg, and light as a cloud texture, will make you wish you had made more of these, so you may want to double this recipe. The day before you want to make your Calas, combine the water and sugar in a small bowl. Add the yeast and let stand until foamy, about 10 minutes. Add the rice and stir well. Cover with plastic wrap and leave at room temperature overnight. This step will really give your Calas a distinctive flavor; think sourdough. The next day, stir the rice mixture and kind of mash the rice against the side of the bowl with a wooden spoon. Don’t go too crazy though, I like to have a bit of that rice texture in the finished product. Add the remaining ingredients to the rice mixture, mix well with a wooden spoon. The mixture should be a fairly loose batter, a little thicker than pancake batter. Cover and let rise in a warm place for 1 hour. This step will make your Calas as light as air when fried! Heat 3 inches of peanut oil in a large saucepan to 365 degrees. Drop spoonfuls of the Calas batter into the hot oil. Fry until golden brown, turning once. 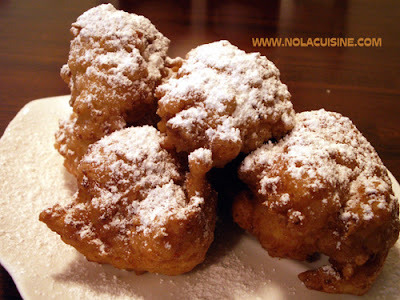 Serve with lots and lots of powdered sugar, like Beignets, or drizzle with Cane Syrup. Recipe makes about 6 good sized Calas. 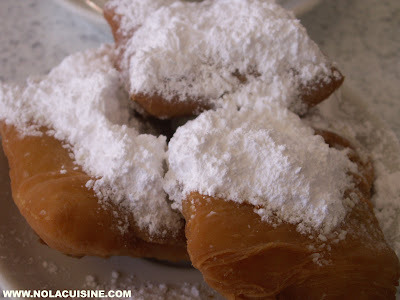 If you haven’t been to New Orleans you’ve probably never eaten a Beignet, but you’ve probably had something similar. Cafe au Lait and Beignets, is New Orleans for Coffee & Donuts. 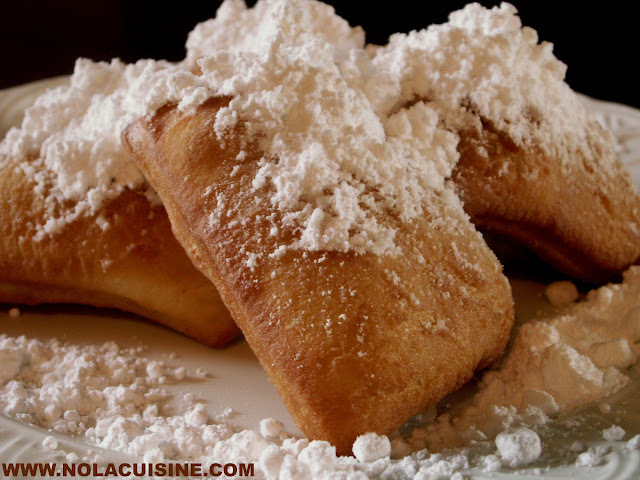 If you are unfamiliar, Beignet (ben-YAY) is French for Fritter, in New Orleans they’re square and topped with a firestorm of powdered sugar and usually served with a steaming cup of Cafe au Lait. Cafe au Lait is equal parts piping hot milk and good, strong Cafe Noir with Chicory (New Orleans Coffee will be another post). 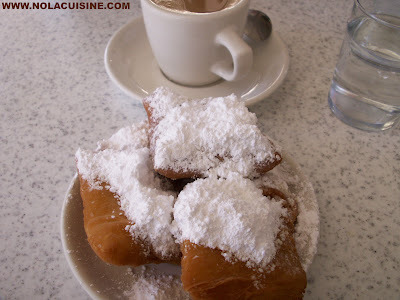 The most famous place in New Orleans for Beignets and Cafe au Lait is Cafe Du Monde on Decatur on the riverside of Jackson Square, which is legendary, you have to go once. The Beignets and Cafe au Lait are great, but I’m not into tourist traps; even when I’m a tourist. Most locals that I’ve talked with prefer Morning Call Coffee Stand which is no longer in the quarter, but has two locations in Metarie. Combine the Yeast, Water, and Sugar in the work bowl of a stand mixer fitted with a dough hook (You could also make this in a food processor, or the old fashioned way, by hand). Let this sit until frothy, about 5 minutes, then add the Salt, Egg, and Evaporated Milk. Mix on low speed, then add half of the flour until it starts to come together, then add the shortening. When the shortening is incorporated start adding the remaining flour, a little at a time until most of it is incorporated. At this time I always turn the dough onto a floured bench to finish by hand, just like when I make bread; it’s a touch thing. Knead the dough adding just enough flour as necessary to make a non-sticky, smooth dough. Place the dough into a large oiled bowl, loosely cover and let rise (I made mine last night and let it rise overnight in the refrigerator). After the dough has doubled in bulk, punch it down and turn it onto a floured surface and roll out into a rectangle that is about 1/2″ thick. With a very sharp knife working at a diagonal to the rectangle, cut into 2″ wide strips. Now cut into diamond shapes by making diagonal cuts in the opposite direction. Place the Beignets on a floured baking sheet to let rise about 40 minutes in a warm place (I place them in a barely warm oven). When the Beignets have risen, heat 2-3 inches of vegetable oil in a large saucepan to 350-360 degrees. Place 2-3 Beignets into the hot oil at a time, being careful not to smash or deflate them. When they are golden brown, flip them over until golden brown on the other side (They go pretty quickly so start checking them right after they go into the oil). Remove to paper towel lined plates to drain. Serve hot topped with plenty of powdered sugar (because the dough doesn’t contain much sugar, you will want a lot!). Best served with Cafe au Lait. Enjoy!